What is the reason for shoulder and arm pain? 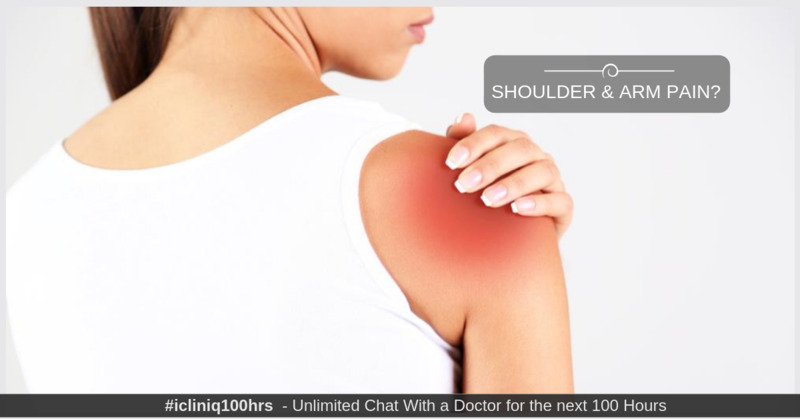 iCliniq › Ask a doctor online › Answers › General Practitioner › Iron Defeciency Anemia › What is the reason for shoulder and arm pain? My wife is 28 years old. She is suffering from shoulder and arm pain. She has more pain during night-time and not able to get good sleep. First we consulted a doctor; he gave some multivitamin and Calcium tablets. Also advised her to do some exercise, but there is no effect. Then we consulted another doctor and he advised for a blood test. The result came back as hemoglobin 10.5 and serum uric acid 5.98. I have attached the medical prescription given by then for 20 days. He also told to avoid pillows. My wife started avoiding milk, milk products, meat, pulses etc. She is feeling fine now. After 20 days when she went for consultation some new doctor was there. He told that the uric acid is in range and no need to continue these medicines. Now again pain is there. Please tell us what test we need to do now to find the problem. Please tell the medicines which would be helpful in this case. Thanks in advance. • I have neck and shoulder pain that go away when I lie down. Any suggestions? Uric acid levels are within normal levels. Hemoglobin levels are reduced and should be around 12 g.
Most probably it is due to iron deficiency anemia. She needs to take Iron and Folic acid tablets for a month and repeat her hemoglobin levels to see that it has returned to normal range. Coming to her shoulder and arm pain, since it is continuous and more at night it could be due to nerve compression. I would suggest you to carry out CT scan of cervical spine to rule out cervical spondylitis. Other causes could be frozen shoulder (shoulder stiffness and pain) where you need to take muscle relaxant like Zerodol (Aceclofenac). If it not able to relieve pain then you can take Tramadol to relieve pain. As you suggested for iron deficiency I have started giving my wife Hematinic syrup. Regarding CT scan of cervical spine, can I show the results to you? Or do I need to consult some specialist? For muscle relaxant Tramadol, can you give a brand name, quantity and frequency? Thank you. It is good that you have started Hematinic syrup to cover up iron deficiency anemia. I would suggest you to show out your CT scan report to an orthopedician since it might be possible that there need to be carry out certain physical tests. So, it is better to see a specialist in person. Zerodol is a muscle relaxant. Tramadol belongs to the class of drugs known as narcotic analgesics and act on opioid pain receptors. So, it is not muscle relaxant. You can take 50 mg to 100 mg of Tramadol at one time. But, do not go beyond 200 mg once in a day since it can lead to central nervous system side effects. You can take 50 mg dose twice a day. Brand name for Tramadol is Ultram 50. I would suggest you to take Tramadol under guidance of specialist since it needs dose titrations. What is the solution for shoulder pain?